The topography of many Western cities is such that, as the corporate limits enlarge, their most populous portions include districts embodying very rugged features. At Pittsburg and Cincinnati steep hills, or rather mountains, bordering the Ohio, have long since been absorbed by the cities named, and these are covered with a dense and growing population. This has been of late years rendered the more possible by the general introduction of the inclined railway, which makes hill climbing a luxury. 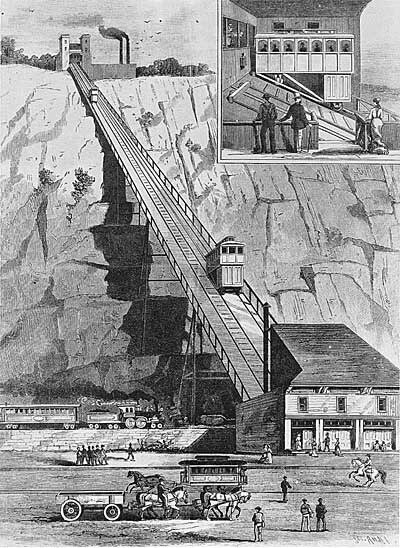 A fair sample of such a railway is noted in the Duquesne Incline Plane Company's roadway at Pittsburg, Pa. In this case the object in view was to surmount the hill known as Mt. Washington, located at the mouth of the Monongahela River and directly overlooking the site of the famous stronghold whose name is given the modern enterprise. The Duquesne is the latest and most complete of four similar enterprises climbing the same mountain. It was opened to the public in May, 1877, and up to September 1, 1880, had carried 500,000 passengers without injury to any one. The perpendicular height reached is 400 feet, length of incline 793 feet, rate of ascent 30-1/2 degrees. The roadway comprises, of course, double track, one car ascending while its fellow descends, and vice versa. The motive power, consisting of a double engine of 70 horsepower, is located at the top of the incline, and motion is communicated to the cars by the means of a large drum carrying steel wire cables of 1-1/4 inch diameter. A supplementary or safety cable, of 1-1/8 inch diameter, is also in constant use. These cables are each 900 feet in length, and are capable of sustaining a perpendicular strain of 50 tons, while the actual working strain is about one-tenth that amount. The safety cable passes around a system of sheaves so arranged that should the working cable part the safety cable will tighten about the sheaves and bring the cars to a stop. The cars, neatly and strongly built, will each seat 25 persons, and in the angle beneath them and between the upper and lower tracks there is a space available for light freight. In the Duquesne roadway there is a 360 foot section of wrought iron bridge work spanning the tracks of the "Pan Handle" Railroad. The rails are of the T pattern, 40 pounds to the foot, and the gauge is 5 feet, the double trackway being 20 feet wide, allowing 3 feet between the cars at the passing point. Rollers of locust and "gum" wood, located at regular distances between the rails, bear the cables in their passage above them. In operating the cars, the engineer in the "cab" at the apex of the incline has absolute control of engine and cars by means of two levers. One operates the reversing mechanism of the engines and the other starts and stops the same. A brake, operated by the engineer's foot, brings sufficient friction to bear upon the cable drum to stop its revolutions even should steam be on. This drum, it might be added, is 12 feet in diameter, with a grooved periphery, and a width of 3 feet 10 inches. The cable winds into these grooves, and the movement of the engines, drum, cables, and sheaves is almost noiseless, and indicate little or no strain upon any of the machinery. Experience in this plane has shown that popular prejudice against this mode of travel has ceased, and on Sundays during the summer 6,000 passengers are carried during the day and evening; the cars ascending and descending as rapidly as filled and emptied. Ordinarily trips are made every five minutes, the trip occupying two minutes. The engines, it might be added, are 21 inch stroke and 14 inch cylinders, operating a shaft bearing a driving piston 3-1/2 (?) inches diameter, gearing into the main driving wheel, which is 12 feet in diameter, 12 inch face. To operate the entire affair for nineteen hours out of the twenty-four requires the services of only five men, namely, two engineers, one conductor, one fireman, and one trackman. The total cost of this incline, cars, real estate, etc., was $47,000, and is considered a paying enterprise by the stockholders. The single fares are 6 (?) cents. The road enjoys a growing popularity as a means of best obtaining a beautiful and comprehensive view of the "Iron City."